When it comes to taking care of myself in college, I will be the first to admit I don't always do the best I can... whether we are talking about healthy eating, washing my sheets enough (sorry, TMI), or even washing my face on a regular basis and taking my makeup off in due time. However, I must be doing something right, because I officially feel very, very happy with my skin and it can probably be accredited to me simply becoming more aware of when I am falling short and doing something about it. Let's start at the beginning: I would not say I have ever had "bad skin," but I did get your average pre-teen acne in middle school, and it was something I was very, very self-conscious about. Between seventh grade and my sophomore year of high school (roughly ages 11-15), I always seemed to have at least one zit or blemish on my face at any given time, and I was really unhappy with my nose in terms of blackhead appearances. I picked and poked at my skin far more than I should (which you really shouldn't do at all) and always ended up making things worse than better. Not to mention, my skincare routine was nonexistent, and at the very least, inconsistent. When I got to college last year, I wasn't a huge fan of the communal bathrooms, like anyone else, and I really tried to stay out of there as much as possible. Between going out more and not having a "clean" place to construct a bathroom routine, I limited my face washing to the shower, and post-party makeup removal to makeup wipes and maybe a splash of hot water on my face before bed. Now that I am living in an apartment, I have the luxury of a nice bathroom that I only share with one other person, and it's really, really nice. I do have my own bathroom at home, but counter space is limited around my skin and even then I find it hard to whip out all of my products and go crazy. That said, my skincare routine is no-fuss and pretty minimal, but I love the products I am using. One thing that I know has dramatically helped my skin is drinking water!!! I drink so much water, and I really feel it when I don't. I personally don't think this makes much of a difference in actually hydrating my skin, but I think it makes a big difference in just balancing out my complexion and washing things out of my system that aren't the healthiest. Back in January I started using this Neutrogena face wash when they sent me a package of skincare goodies. It was just around the time I finished off a bottle of this Fresh face wash I had been using, and I switched to the Neutrogena with a little hesitation because I had loved the Fresh product so much. However, it is pretty expensive to buy a new bottle of $40 face wash every couple of months, and within a few weeks my mom was already telling me my skin looked healthier and better! Needless to say, I love using the Neutrogena face wash and it might be one of the few "sponsored" products that I actually will go out and repurchase with my own money because I loved it so much. If you are a long time reader over here, you might know that I have been using my Bobbi Brown gel moisturizer for years. I think I bought it for the first time when I was 12 or 13! I truly love it and feel that it hydrates my skin so well while being incredibly light and long-lasting. Each container lasts me roughly five months, so a little goes a long way and I would 110% recommend this product even at it's higher price point. I moisturize both at morning and at night (75% of the time) and always right when I get out of the shower. When I have a zit or a pimple (wait, is there a difference?) I have gotten so much better about not popping them or poking at them at least for a few days (if it's a long lasting one) or until it looks "ready". I apply this drying/spot treatment on top of it overnight and do that every night until it goes away on it's own or it's ready to pop. About once a week I try to do a face mask, and this is the one I use. I got it for Christmas and I have only used it a handful of times so far, so I honestly can't really tell if it works for me or not. Whatever, I still like it! Also, about two-three times per week I like to exfoliate my face when I am in the shower. I rotate between this scrub and this scrub. Both are really gentle and smell so good-- I just reach for whichever one I didn't use the last time to make both products last longer! Every night before bed I apply a thick layer of Argan Oil all over my face, massage it in, and then apply extra drops to my eyelids, eyelashes, and eyebrow area. I started doing this one or two months ago, and it has dramatically enhanced my "glow". Compared to other oils, Argan Oil is completely safe to use on your face because it doesn't clog your pores at all! If I have a zit, I will just avoid applying oil to that area and apply my spot treatment I mentioned above so that the spot can dry out and go away. When I am on the go I always have this Mario Badescu rose water spray with me. I like to spray it on my face whenever I need a little hydration because it makes your skin glow and feel extra soft! For my lips, I am loyal to this Nurse Jamie lip balm and absolutely believe nothing works as well! I also love to use the KNC lip masks when I need extra hydration or want a little plumping action. They're so fun to use especially when you're just hanging out and watching a movie with girlfriends! 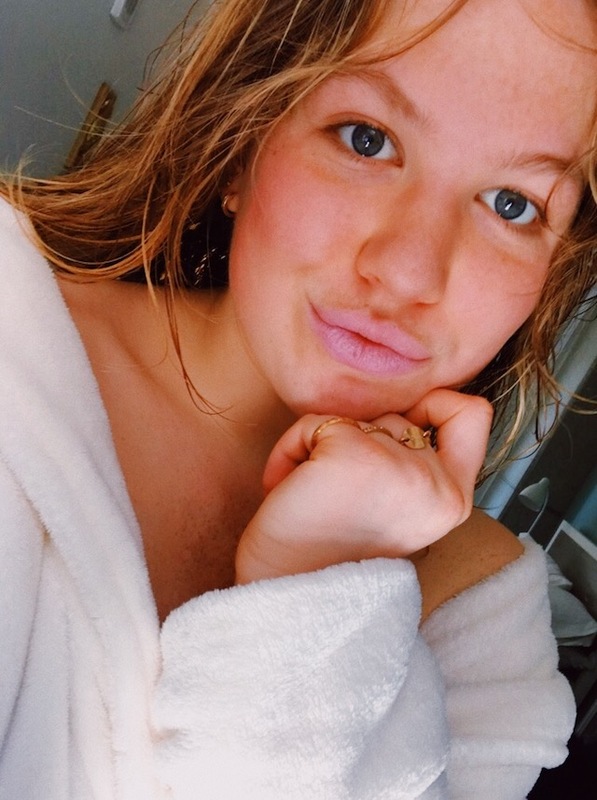 Other than that, when it comes to wearing makeup, I would love to dedicate a separate post about my makeup routine and products I use, because there are definitely a lot! However, I don't wear makeup everyday by any means, and rarely to class or on the weekends. If anything, I apply this mascara and eyebrow product, but I keep it pretty light. I usually try to only wear makeup if I am going out at night with my friends or doing something where I want to look and feel more put together. If I do want to cover something up though, I use this foundation and I love it-- it matches my skin perfectly and it is so lightweight. Something I wanted to ask you all for your advice on-- has anyone tried any products that help make your eyelashes grow? I want to get into the routine of using something like this and I need your advice on what's best! I hope you enjoyed this post! I would love to hear your favorite skincare products and read your skincare routine if you've shared a similar post on your own blog! I'm slowly starting to get into a skincare routine (moisturizer! ), but it is definitely hard because I've pretty much always have had clear skin besides middle school. I would love for you to share your make up routine! I know what you mean-- it can be so intimidating but slowly adding things in step by step worked for me! Thanks for sharing! I've been really trying to be strict about my skincare routine and keep up with it! I honestly never thought about using argan oil on my face before but I think I might try it out! Do you use the argan oil on top of your moisturizer?